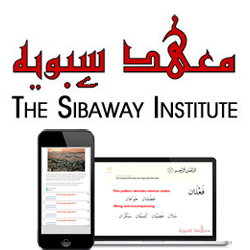 The Sibaway Institute is the product of extensive research and a desire to provide a platform for seekers of knowledge from any part of the world to learn the Arabic language and understand the Quran, which is the pinnacle of linguistic excellence and a miracle from Allah (Most High). ​Alhamdulillaah, we have now become the forerunners in teaching Classical Arabic. Since our aim is to provide this education to students from all around the world , our courses are reasonably priced. The Sibaway Institute has a comprehensive curriculum which is one of its kind that helps the students to advance quickly and thoroughly in their understanding of the Arabic Language. Our courses also serve as motivation because there is nothing more motivational then experiencing the Quran linguistic miracle firsthand. The Sibaway team takes great measures to provide professional and quality service, dedicated academic support and excellent education to the students. We have a variety of courses and study options for the students to choose from. Many Scholars have stated that having a sound understanding of the Arabic language is a prerequisite for learning and teaching the Quran. Ustadh Nabeel AlKhalidy, who has been a student of the Arabic language for over 15 years, is the co-founder and director of the Sibaway Institute. His love for the Arabic language and his desire to impart this knowledge to anyone from anywhere around the world made him envision a place of learning using the medium of internet which would cater to the needs of the student of knowledge and the beginner alike. This led to the launch of the Sibaway Institute in the year 2009.